Born in Liege in 1822, César Franck’s early life was haunted by a rather over-bearing father who had great ambitions for his undoubtably talented son. Seeking the fame and fortune such talent could bring to their family, Franck’s father moved the family to Paris in 1835, eventually enrolling his son at the Paris Conservatoire in 1837. By 1845 the widespread recognition had not materialised and the poor reception Franck received in response to the premiere of his first large-scale work, Ruth, no doubt contributed to the young man cutting ties with his parents for good. Stung by the criticism and constant parental pressure Franck largely retreated from public life and earned a living as a teacher and organist until 1858 when he was appointed organist of Ste Clotilde. Installed at his new post, Franck was obliged to provide music for services and his improvisation skills became legendary, yet it was only much later that he would return in earnest to composition. Despite his dutiful inclusion in Saint-Saëns’s early Société Nationale de Musique concerts, Franck only returned to writing fully from 1875 and continued until his death in 1890. 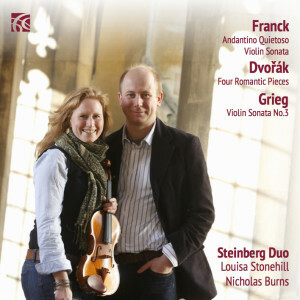 Franck’s violin sonata has become one of the most familiar and well-loved of the genre. It was written in 1886 as a wedding present for his violinist friend, Ysayë. Presented to the groom on the morning of his wedding, it was first performed after a hurried rehearsal at the wedding breakfast. It was later given its first public performance at a gallery in Brussels, again with Ysayë playing. The programme was long and as no candlelight was allowed in the gallery, fear grew that the performance of the work would have to be abandoned in the failing light. Fortunately, Ysayë and his pianist played on in the gloom, completing the performance in almost total darkness from memory. The work itself neatly encapsulates the story of the happy bride and groom. The first movement evokes the first flickers of attraction, eventually building to great outbursts of love. The couple, now together face their first feud in the second movement where the spurned party can be heard in the pleading quieter passages while the violent fury of the faster writing vividly portrays their conflict. All is resolved in the quietly meditative slow third movement before the famous finale cleverly captures the wedding ceremony itself. Written in canon, the violin follows the piano exactly before the roles are reversed, mirroring the repetition of the wedding vows. The quiet, solemn writing evokes prayer and again huge outbursts of emotion punctuate the writing before we once again hear the celebratory Parisienne bells right at the end.